Evaluation provided a test and evaluation framework for the assessment of each interactIVe application with respect to human factors and technical performance. Also, test scenarios, concrete evaluation methods, and test procedures as well as tools for evaluation like equipment, test catalogues, procedures, questionnaires or software and support for testing have been provided. Test and evaluation criteria were defined. The corresponding legal aspects for broad exploitation of the applications have been analysed. 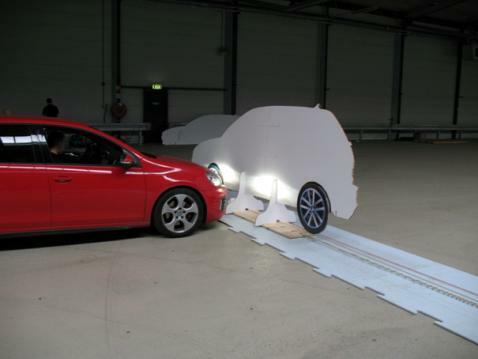 The first tests were conducted in July 2012 on Volkswagenï¿½s outdoor test track in Wolfsburg (Gerï¿½many) and in September 2012 at the TNOï¿½s indoor testing facility, ï¿½VeHILï¿½, in Helmond (Nethï¿½erlands). 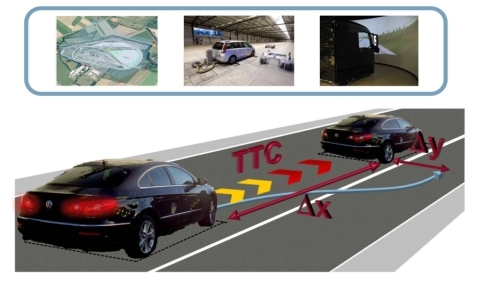 The rear-end collision scenarios and crossing traffic scenarios were tested on both the test track and in VeHIL. The tests for the SECONDS and INCA demï¿½onstrator vehicles are scheduled for the beginning of 2013 and are already ongoing. The results of the tests have been presented at the final event. Testing collision mitigation functions at ï¿½VeHILï¿½ indoor testing facility, in Helmond (Netherlands) in September 2012. The sub-project ï¿½evaluation and legal aspectsï¿½ has finalized the test and evaluation plan for interactIVe. The document describes the evaluation methodology for the technical, user-related and safety impact assessments in interactIVe. The used evaluation method is based on the evaluation method used in PReVAL, which has been updated for the interactIVe purpose. Furthermore the document includes detailed test plans for each of the seven interactIVe demonstrator vehicles. Therefore the sub-project ï¿½evaluation and legal aspectsï¿½ has developed a comprehensive list of test cases considering different scenarios. The project deliverable ï¿½Test and evaluation planï¿½ will be available on the interactIVe webpage in autumn 2012. On November 24th, 2011 a workshop on legal aspects was held at the Federal Highway Research Institute (BASt) in Bergisch Gladbach, Germany. Focusing on interactIVe applications aspects of vehicle type approval, road traffic law and product liability on EU level were discussed. Basis for discussions were the project deliverable ï¿½Legal Aspectsï¿½. This document has been written by BASt and ika with regard to the legal framework for the developed interactIVe functions. The deliverable covers the vehicle type-approval for interactIVe functions according to relevant UN ECE regulations as well as the legal framework on EU-level with the focus on product liability and international law (Vienna Convention on Road Traffic). The project deliverable ï¿½Legal Aspectsï¿½ will is available on the interactIVe website. During the latest workshop on evaluation in April 2011 in Brussels the participants dicussed the hypotheses for the interactIVe functions, which will be assessed. They had been defined by the sub-project evaluation and legal aspects in the deliverable ï¿½Specifications of the Evaluation Frameworkï¿½ based on the deliverable ï¿½Requirements for the Evaluation Frameworkï¿½. Both documents are public and can be downloaded here. The upcoming ï¿½ also public ï¿½ deliverable ï¿½Test and evaluation planï¿½ will include a description of the methodology for the assessment and the test plans for the developed functions. One major challenge regarding the test plan is the reduction of the testing effort due to the high number of use cases and the different demonstrator configurations. It also needs to be ensured that all necessary data for a sufficient assessment are collected in the conducted tests. Where and which way ï¿½ on a test track, in a driving simulator or even real traffic - are the tests performed? When will which function be tested and which equipment - available reference system, target objects - is needed? Who is performing which test? have to be answered during the next steps.